A Power of Attorney (PoA) is a legal document that authorizes a person to represent or act on someone else's behalf. It is a written statement declaring that Person A authorizes Person B to take important decisions on behalf of person A, especially in legal matters. 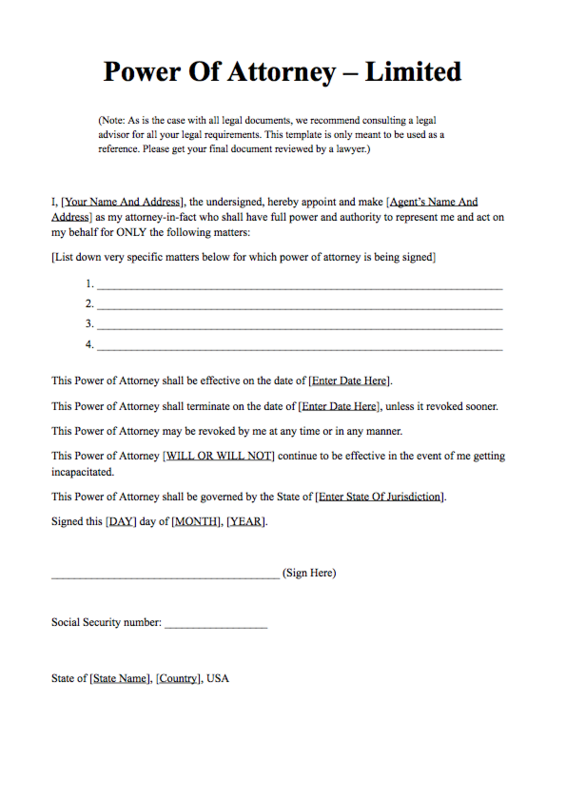 Using this Power of Attorney form template available for download below, you will be able to create a Power of Attorney document for yourself. It is important to note that legal requirements differ from place to place, and the Power of Attorney content and requirements are largely dependent on which country you're a citizen of and what the jurisdiction of your residence is. As is the case with all legal documents, we recommend consulting a legal advisor for all your legal requirements. In a Power of Attorney (PoA) document, the person that authorizes or designates is called the Principal, whereas the person who will represent or act on behalf of the Principal is called the Agent. The agent is also referred to as the 'Attorney-in-fact' in some places. The Power of Attorney template is commonly used in cases where principal is incapable of presenting themselves, often due to old age, illness or disability. In such cases, an agent is appointed to sign legal or financial documents on the principal's behalf. Contrary to what the name suggests, an agent need not be an actual attorney at law, and is usually a family member or friend. You can edit the PDF using PDF Expert, the best PDF Editor app for Mac. Using PDF Expert, you can type and add your own details and use this power of attorney form for your own needs.